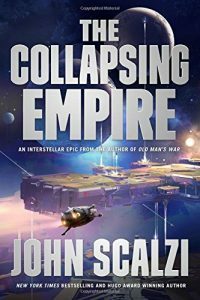 An hour-long talk with bestselling, award-winning science fiction author John Scalzi about how and why he writes, focusing on his latest novel, The Collapsing Empire. 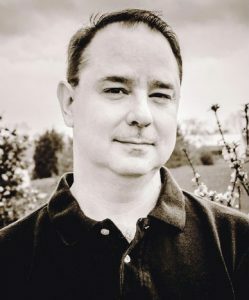 John Scalzi was born in California in 1969 and currently lives in Bradford, OH. He studied philosophy at the University of Chicago, which is where he began his freelance writing career. He wrote film reviews and was a newspaper columnist for a few years, and in 1996 was hired by AOL as its in-house writer and editor. He wrote his first novel, Agent to the Stars, in 1997 and published it free on his website in 1999. His first published novel, Old Man’s War, also appeared first on his blog (serialized a chapter a day) in 2002. Tor Books purchased it, publishing it commercially in 2005, and it went on to win the John W. Campbell Award for Best New Writer. Since then, John has won numerous awards, including the Hugo, the Locus, the Audie, the Seiun and the Kurd Lasswitz, plus the 2016 Governor’s Award for the Arts in Ohio. His work regularly appears on the New York Times bestseller list for fiction. First, we establish that your genial host was literally the first person John met in science fiction and fantasy besides his editor, Patrick Nielsen Hayden: we were on a panel together at the 2003 Toronto WorldCon on the topic (if we remember right) of other ways to make money writing besides writing fiction. John traces his interest in science fiction back to childhood reading, specifically mentioning Robert A. Heinlein’s Farmer in the Sky as one of the first SF books he remembers. He adds that SF is capacious enough you can write whatever you want, and he’s gone on to write a couple of what are essentially science-fiction mystery novels, Lock In and Head On. He kind of fell into his philosophy degree (he was undecided, but discovered he’d taken enough philosophy courses to graduate sooner than if he’d gone for, say an English degree), and agrees it doesn’t have a lot of real-world utility, but feels it has had value in his work. He says philosophy teaches you how to learn, and how to think more deeply about things, useful in writing science fiction. Fun fact: Saul Bellow was briefly John’s thesis advisor. He gives a synopsis of The Collapsing Empire, which is about an interdependent network of worlds that rely on a natural phenomenon called the Flow, which permits interstellar travel. The Interdependency (as it’s called) finds itself in serious trouble as the Flow begins to collapse, cutting worlds off from the rest of humanity. “When humans are confronted with natural things that actually don’t care about human’s plans one way or the other, how do they dal with that?” He notes that has parallels in both the past and the present. John begins building characters from archetypes. He knew he needed someone at the very top (the emperox, Cardenia), someone at eye-level (the scientist, Marce, a.k.a. “exposition guy”), and a “wild card” (Kiva). Once he knew he needed those types of characters, then he began to develop their personalities. I noted that his approach to developing characters seemed filmic–starting with archetypes, working down–and asked if his long interest in and observation of film ties into the way he plots and writes. John said, “Absolutely.” He notes Old Man’s War very clearly has a three-act cinematic structure, because that was a storytelling grammar he was used to not only from watching films but from analyzing them during more than a decade of writing film criticism. “In many ways my storytelling school was not really novels, it was film.” He also notes that his novels are “dialogue-heavy,” something else that comes from film. He doesn’t anticipate writing any of the scripts for the Old Man’s War and The Collapsing Empire TV adaptations, since he doesn’t have any concrete experience in the field. However, he notes his experience as a reviewer, and hence familiarity with other screen adaptations, has made it easier for him to talk to producer–unlike some authors, he understands that the filmic version of a story and the novel version are very different, and changes have to be made to make the former work as well as the latter. He has written a screenplay adaptation of his novella The Dispatcher as an exercise and has received positive feedback on it, and does hope o write a script or screenplay in the future. There is a brief aside about the alien lifeforms making mewing noises in the background. Asked if he rewrites, John says, no, not in the sense of finishing a draft and then rewriting it from the beginning: he does “rolling rewrites,” so when he gets to the end, he’s done. Two reasons: as a former journalist, “where you have write a couple of thousand words every few days and it’s all due at 3 p.m. and you have to write clean copy,” he learned to organize his thoughts as he wrote. Asked to comment on the concept of “worldshaping,” versus “worldbuilding,” he says that when writers create worlds what they are really doing is taking what they already know, introducing new highly speculative (and hopefully interesting elements), and then mashing them together to find out what comes out the other end. , mashing them together, finding out what comes out the other end. He notes that, not only is it very difficult to create a completely new world, it would be a very hard book to sell, because there would be no hook there for the reader…and that’s important, because science fiction and fantasy writers are working “more or less in service to a commercial genre.” Writers have to think not only about what they want, but what editors and readers want. He points out that Old Man’s War is “Starship Troopers with old people,” a Heinlein juvenile with senior citizens. That was intentional, he says. He wanted to write a book that would sell, so he looked at what was popular at the time, which was military science fiction. So he decided, “I’m going to write a military science fiction book on my terms. I’m going to give people what they want, and then I’m going to give myself what I want, and then we’re going to see what works out. Instead, he says, he only started writing when he had an audience. “For me, writing has always been an extroverted act, not just for myself, but primarily for other people to read.” The gratification it provides comes from the ability to make people feel things through the power of words: to persuade, and argue. He says his writing has had an impact on the real world. Some things in his stories–like the enhanced artificial blood in Old Man’s War–has piqued the interest of real-life scientists. SF offers something few other genres do, he notes, in that people sometimes read about something in SF and think, “This is cool, I want this in the universe,”–and then they go out and build it.